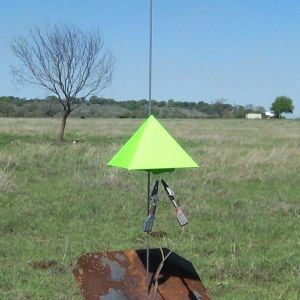 The 18mm Pyramid is a saucer-style rocket that flies on 18mm motors. At ejection, the motor mount separates from the main body then the motor mount tumbles to the ground while the main body gently floats to the ground. This kit consists of two sheets of printed cardstock with four pages of detailed instructions with pictures. There are four main sub-assemblies: the main body, motor mount tube, motor mount skirt, and an internal nose cone, which is the receptacle for the motor tube. The instructions were easy to follow and I completed the rocket within two hours. The only tools needed are scissors, X-Acto knife, white glue, ruler and a pen. The main body and the internal nose cone are glued together to form one part of the rocket, and the motor tube and motor skirt are glued together to form the motor mount for the rocket. All of parts fit together well. The instructions recommend spraying the rocket with clear coat. 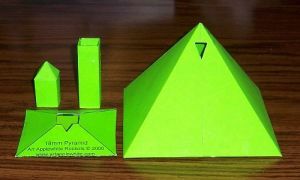 The 18mm Pyramid is available in several bright colors and I chose not to add a finish to the rocket. The design of the motor mount tube is very nice. The square motor tube has just the right amount of give to firmly hold the motor in place. I did not have to use masking tape for motor retention. I used a small amount of wadding to protect the inside of the pyramid as suggested by the instructions. I launched the 18mm Pyramid three times on A8-3, B6-2 and C6-3 motors. The simulated altitudes for these three flights were 58, 82 and 161 feet. All three flights were great. The first flight on the A8-3 did turn into the wind a bit. The B6-2 and the C6-3 were both straight up. In all three flights the pyramid landed close to the launch pad. At ejection, the motor mount tumbles down while the main part of the pyramid gently floats to the ground. This is a great rocket for all sizes of launch fields. After three launches there is a small amount of black power residue inside the pyramid, but there is no damage and I should be able to launch the pyramid many more times. 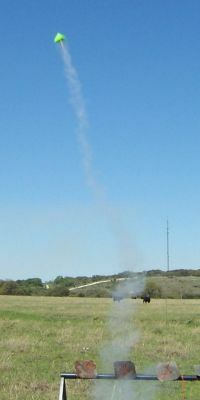 This rocket is inexpensive and easy to build. It flies straight up and the recovery is always near the launch pad. The flight on the C6-3 is a great crowd pleaser.